Interesting PhD thesis The Stone Age of north-eastern Europe 5500–1800 calBC : bridging the gap between the East and the West by Kerkko Nordqvist (2018). The arrival of Corded Ware is without a doubt the clearest example of migration recognized in Finnish Stone Age archaeology. Its appearance has been understood to result from the movement of a new population from the southern or southeastern Baltic Sea area to the southern and western coasts of Finland (Europaeus 1922: 137; Luho 1948: 57; Edgren 1970: 62; Matiskainen 1994: 14) (Fig. 36). Native inhabitants of the coastal region — presented as representatives of Comb Ware population — have rarely been given any larger role in this development (Luoto 1986: 19; Asplund 1995: 74; see also Article III), and their fate has usually been described as displacement, assimilation or some kind of co-existence (Äyräpää 1952a: 24–25; Edgren 1997: 169–171; Carpelan 1999: 263–264; Núñez 2004: 362). Another important part of the Finnish narrative is the distance that the Corded Ware population assumedly kept, not only from the (Pöljä Ware-producing) hunter-gatherers inhabiting the Finnish inland, but also from the other Corded Ware groups in the northern Baltic Sea area (Edgren 1970: 61; Äyräpää 1973: 199, 207; Carpelan 1999: 266).56 The image of Finnish Corded Ware is static: it is seen to exist in the area of present-day Finland facing little change for centuries (Edgren 1992: 96; see also Luoto 1986: 17; Matiskainen 1994). However, the archaic nature assigned to Corded Ware derives greatly from the out-dated idea of pan-European A-horizon, unrealistic dating given for the phenomenon, as well as an overly narrow view of cultural dynamics concerning what can be accepted as Corded Ware (cf. Furholt 2014; Article III). The only larger change has been connected to the so-called 2nd wave of Corded Ware, supposedly reaching Finnish coasts from Estonia towards the end of Corded Ware’s existence. However, this event has never really been substantiated, and in Finnish assemblages it seems to materialize only through the so-called sharp-butted axes (see Soikkeli 1912; Äyräpää 1952b: 89–90) (Fig. 37) — pottery related to the 2nd wave has never been presented, although its influences are recognized in later pottery types (Carpelan 1979: 15; Carpelan et al. 2008: 206; see also Lavento 2001: 24–25). Along the northern limit of Corded Ware, in the so-called Middle Zone, the 2nd wave assumedly contributed to the creation of hybrid pottery, which in the earlier research has been vaguely called Middle or Intermediate Zone Ceramics (Carpelan 1979: 15; 2004b: 52). More recently it has been proposed that such mixing of influences and hybridization would have started immediately or soon after the arrival of Corded Ware at least on the south-eastern coast and the Karelian Isthmus, and influences would have been transmitted towards the inland and the middle-zone, too (see Mökkönen 2011: 62–63; Article III; see also Carpelan 1999: 262). 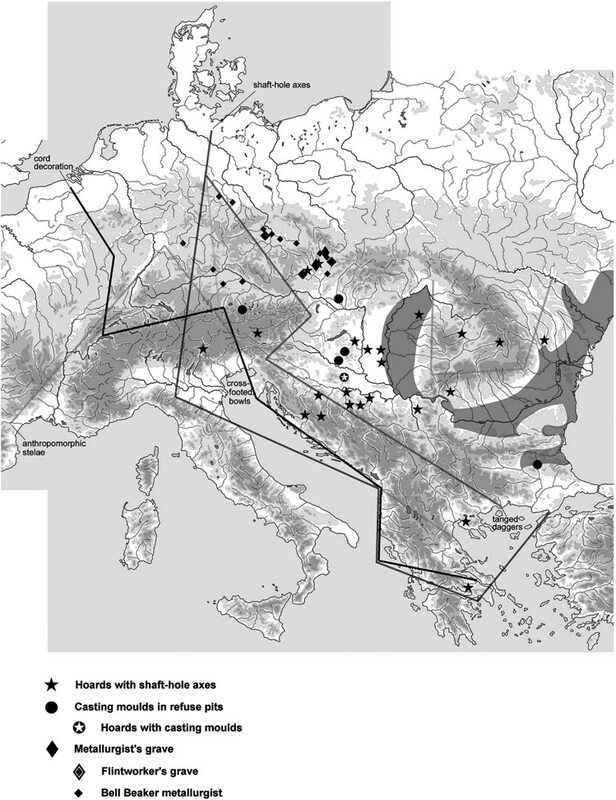 Distribution of the so-called Middle and Late Neolithic asbestos- and organictempered wares. Organic admixtures were commonly used in wide regions to the east and south-east of the research area during this time as well, but asbestos-tempered pottery has only occasionally been reported from areas further east of Lake Onega, the Vologda and Arkhangelsk Oblasts (see Ошибкина 1978; Козырева 1983; Жульников 2007). Illustration: K. Nordqvist. The emergence of Corded Ware was previously dated in Finland as early as 3200 calBC (Edgren 1992: 92; Matiskainen 1994: 14; Carpelan 2004b: 48–49). The age was based on a few conventional dates from mixed contexts, and has been lately readjusted to around 2900–2800 calBC (Mökkönen 2011: 17–18; Article III). This has not only moved the dating closer to the initial dates given to Corded Ware in Europe (Włodarczak 2009), but also changed the cultural context into which Corded Ware may have arrived in north-eastern Europe. The old dating permitted the assumption of a temporal overlap with Typical/Late Comb Ware (see Edgren 1970: 59–60; see also Carpelan 1999: 262) — with regards to the new dating, even if the Comb Ware tradition continued in some form to the 3rd millennium calBC, it is really not known how the coastal societies transformed and what they looked like during this time. All in all, only a few sites have been securely dated to the 3200–2800 calBC period, which makes estimating all the mechanisms through which Corded Ware was established quite complicated. Most Corded Ware materials derive from mixed, multi-period settlement contexts, which explain the generally limited knowledge about Corded Ware assemblages. Pottery is the most commonly identified element, although its study has been heavily concentrated on beakers and beaker-like cups: apart from so-called short-wave moulded vessels, household pottery is not much recognized (Edgren 1970: 25–26; see Nordqvist & Häkälä 2014: 18–19). Furthermore, apart from individual remarks, organic tempers have been excluded from the Corded Ware technological repertoire in Finland (Edgren 1970: 33; Korkeakoski- Väisänen 1993: 15) — as shown in Article III, organic-tempered Corded Ware is present at least on the Finnish southern coast and the Karelian Isthmus, and has been reported from Southern Ostrobothnia as well. Organic-tempered pottery found in southern Finland is similar to the so-called Estonian (or Late) Corded Ware, which is thought to be the result of local development (Янитс 1959: 166; Kriiska 2000: 75; see also Kholkina 2017: 155) (Fig. 38). 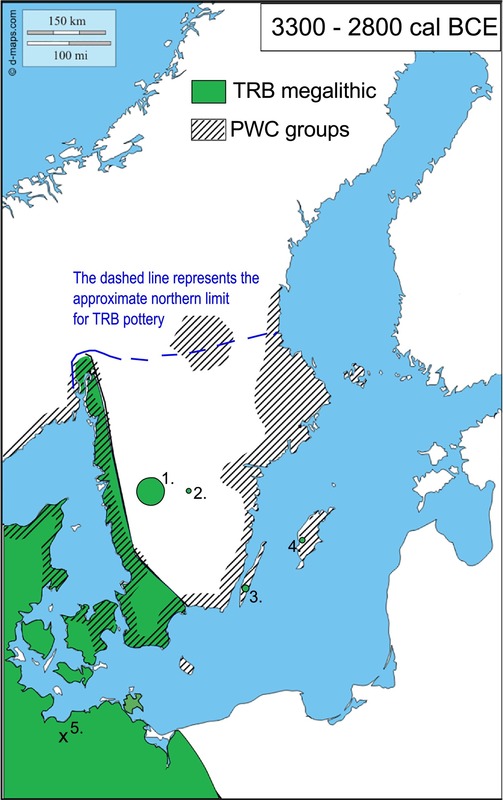 Even preliminary mapping of such pottery (Finnish data is still based on non-systematic survey) shows that an interaction sphere existed in the eastern Gulf of Finland area, reaching from Estonia to the areas of present-day Finland and the Karelian Isthmus in Russia (Article III) (Fig. 36). Sharp-butted axes fit well into this context: rather than being an indication of some ambivalent and unidirectional 2nd wave of influence, they provide better evidence of more continuous contacts across the sea. 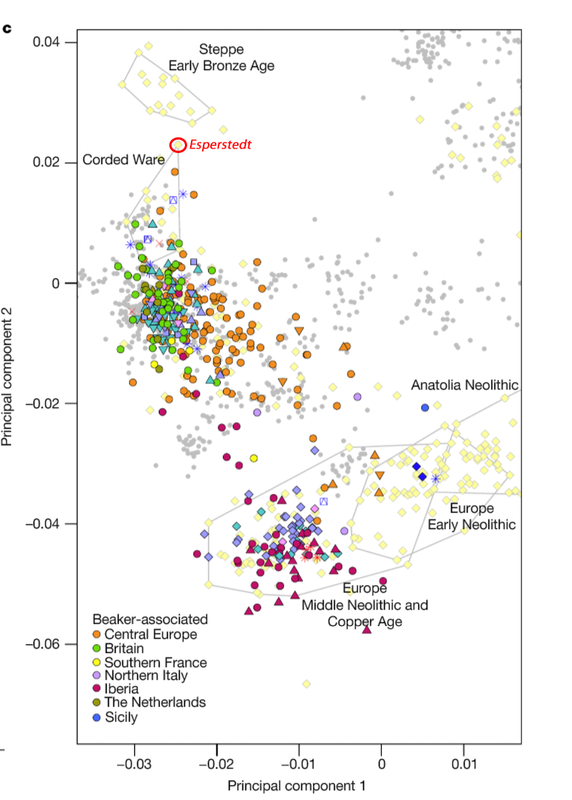 The origins and spread of Corded Ware have become highly topical in the last few years with the development of analytical techniques such as genetic and isotopic research (Allentoft et al. 2015; Haak et al. 2015; Sjögren et al. 2016; Kristiansen et al. 2017). Generally, archaeogenetic studies have evidenced large population replacements in Europe, and seem to provide solid support for migration — still, numerous problems related to representativity and interpretation of the data remain to be solved (see Vander Linden 2016; Heyd 2017; Ion 2017). No material is available for such studies from the research area, as no bones have been preserved in the excavated burials. The closest analysed and published individuals from Estonia, Latvia and Lithuania (Allentoft et al. 2015; Jones et al. 2017; Mittnik et al. 2018; Saag et al. 2017) show that the development of Corded Ware in the Baltic States clearly involved newcomers. At the same time, archaeological materials from north-eastern Europe also indicate the input and presence of indigenous people — settling this discrepancy between different source materials is an important task for future research. The results presented above illustrate how the modern political borders may appear to be present in the past. 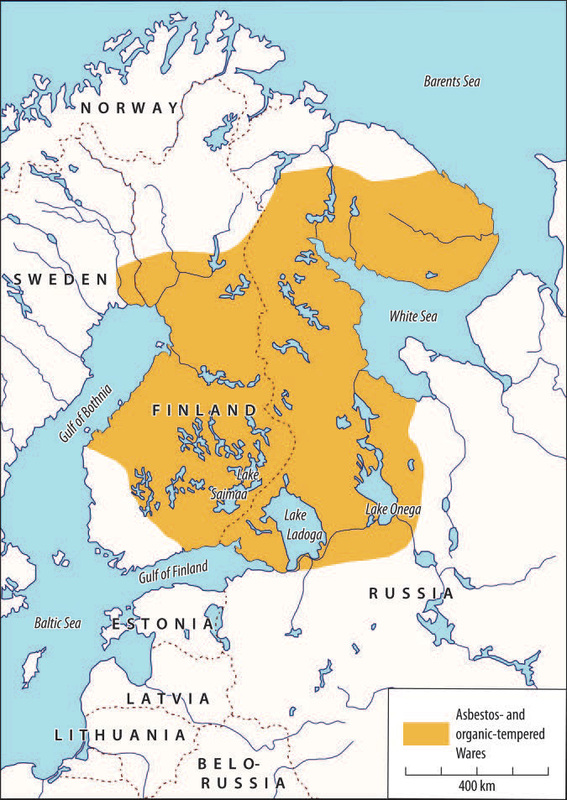 For Finnish prehistory they mean also that instead of one ‘Finnish’ group, there are several Corded Ware populations operational within the present-day state. Recent geochemical analyses of clay pastes and grog tempers of Corded Ware have pointed towards the existence of different pottery recipes in different parts of Finland, as well as towards connections and movement across the northern Baltic Sea area (Holmqvist et al. 2018). 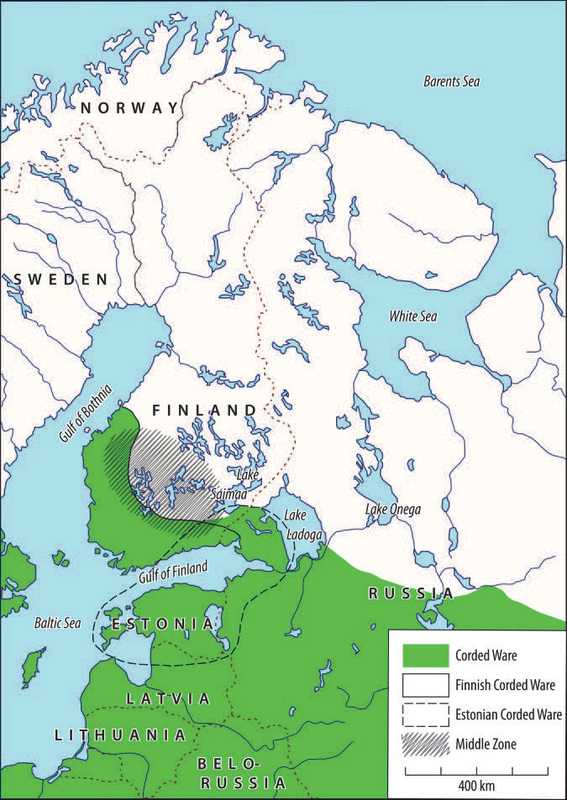 The area of Battle Axe/Corded Ware cultures (shaded), with the traditional limit of Finnish Corded Ware shown as a solid line. The distribution of organic-tempered (Estonian) Corded Ware is marked with a dashed line, while the so-called Middle Zone is indicated roughly by hatching. Illustration: K. Nordqvist. In the present-day Russian territory, a Corded Ware presence has been recognized on the Karelian Isthmus (Крайнов 1987b: 61, Карта 6). In Finnish archaeology this area has been mostly considered a periphery of Finnish Corded Ware (Äyräpää 1952a: 22–23; 1973: 207; Meinander 1954a: 151–152; Huurre 2003: 236; Carpelan et al. 2008: 206), but the identification of organic-tempered Cored Ware in areas north of the Gulf (as well as mapping of all stray finds; Nordqvist & Häkälä 2014; Article III) shows that a Corded Ware presence on the Isthmus was stronger than thought. In other words, the normative perception of culture and strong presuppositions of what Corded Ware should be has led to the exclusion of part of the material culture — the Karelian Isthmus was not just a subsidiary area of Finnish Corded Ware, but a region with its own character and tradition. 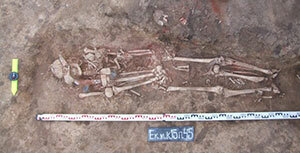 No Corded Ware pottery finds have been reported in the areas north of Lake Ladoga. The solitary Corded Ware influences noted in simultaneous Karelian pottery have been connected with the central Russian Fatyanovo culture (Жульников 1999: 53–54; 2008: 419). Because the Fatyanovo territory extends close to the research area in the east and south-east (see Крайнов 1987b: 61, Карта 6; see also Жульников 2008: 417, Рис. 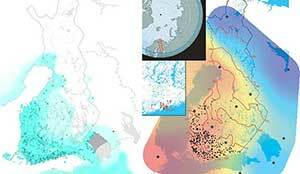 3), it is not surprising that recent studies have revealed evidence of connections between the eastern Gulf of Finland and central Russian battle axe cultures (Kriiska et al. 2015: 47; Крийска et al. 2015: 201; Article III; see also Kholkina 2017: 154–155). The East has been mostly contextualized through the cultural entity perceived to exist between the Baltic Sea and the Urals, i.e. the ‘Comb Ware cultural sphere’. 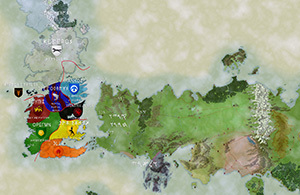 Its binding elements have been kinship- and exchange-based connections, which would have transmitted influences over this vast area. Karelia, the closest-lying region of the East, has been occasionally mentioned as an important area of influence (Tallgren 1938b; Äyräpää 1944), but generally it has not been given any prominent position in the narratives. In fact, Karelia and much of the Comb Ware sphere gained their insignia and paraphernalia already during the first half of the 20th century, and only fairly petrified stereotypes have been presented in the subsequent literature. Periodization-wise the question is straightforward: the Neolithic ends with the onset of the Early Metal Period, the Eneolithic (in Russia) and the Bronze Age (in Finland). 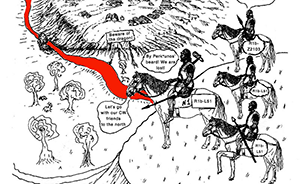 A much larger problem affecting the study of transition has been the general decrease and even lack of archaeological material pertaining to this time. This situation prevails in large areas from the later 3rd millennium calBC onwards and is accentuated during the 2nd millennium calBC. The disappearance of archaeological evidence has been explained by decreasing population numbers which would have been caused by the deteriorating climate (Lavento 2015: 125; see also Sundell 2014). Nevertheless, in the territory of present-day Finland the abundant number of burial cairns (see Meinander 1954b: 89–120; Saipio 2011) as well as pollen analyses showing anthropogenic activities dating to this time (see Alenius et al. 2009; Augustson et al. 2013) indicate that no complete depopulation took place. Therefore, in addition to sparse habitation, the change must be explained also through changing ways of living and material cultures, which make the material remains more difficult to identify archaeologically (also Lavento 2015: 125, 132). The changes taking place during this time seem to be connected to external influences. On the coast, the Kiukainen culture is thought to have transformed under Scandinavian influences into the so-called Western Bronze Age, exhibiting changes in their settlements, material culture, means of subsistence and their world view (Meinander 1954b: 196–197; Lavento 2015: 198–199). Development further east, in the areas previously occupied by populations producing asbestos and organic-tempered wares, is characterized by the appearance of so-called Textile Ware, apparently introduced there by a new population originating from the south-east and ultimately from the Volga region (Meinander 1954b; Гурина 1961; Косменко 1992; Lavento 2001). Even though it is not clear what the relationships between the carriers of this new tradition and the local populations were (did the latter perish, assimilate, or coexist? ), it is evident that changes took place in all fields of life — and the traditional image of an archaic, static inland is not considered correct anymore (see Saipio 2008; Lavento 2015). However, this does not imply one synchronous or abrupt change or a complete turnover but, for example, traditional forms of subsistence held their ground alongside (slash and burn) agriculture for centuries, even millennia to come. 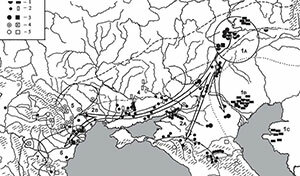 All in all, a complex account of events in North-East Europe that will define the ethnolinguistic identification of Corded Ware migrants. The official papers Olalde et al. (Nature 2018) and Mathieson et al. (Nature 2018) have appeared. 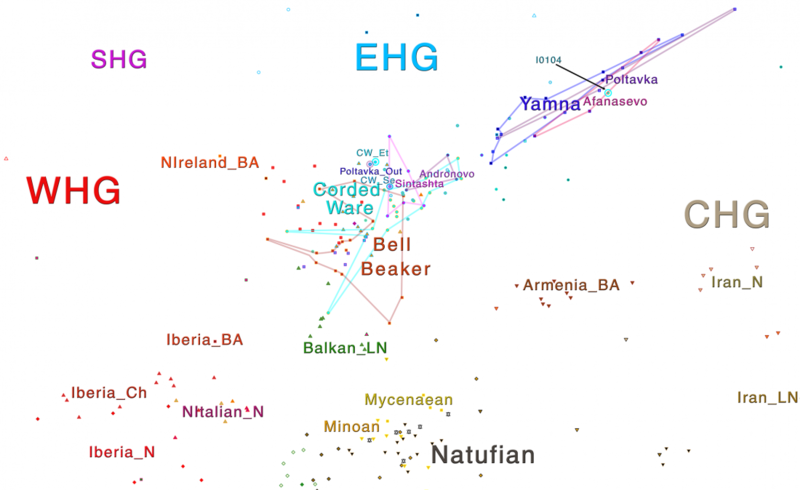 They are based on the 2017 preprints at BioRxiv The Beaker Phenomenon And The Genomic Transformation Of Northwest Europe and The Genomic History Of Southeastern Europe respectively, but with a sizeable number of new samples. Papers are behind a paywall, but here are the authors’ shareable links to read the papers and supplementary materials: Olalde et al. (2018), Mathieson et al. (2018). NOTE: The corresponding datasets have been added to the Reich Lab website. Remember you can use my drafts on DIY Human Ancestry analysis (viz. Plink/Eigensoft, PCA, or ADMIXTURE) to investigate the data further in your own computer. Image modified by me, from Olalde et al (2018). PCA of 999 Eurasian individuals. Marked is the late CWC outlier sample from Esperstedt, showing how early East Bell Beaker samples are the closest to Yamna samples. I don’t have time to analyze the samples in detail right now, but in short they seem to convey the same information as before: in Olalde et al. 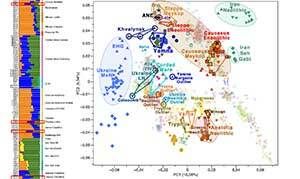 (2018) the pattern of Y-DNA haplogroup and steppe ancestry distribution is overwhelming, with an all-R1b-L23 Bell Beaker people accompanying steppe ancestry into western Europe. EDIT: In Mathieson et al. (2018), a sample classified as of Ukraine_Eneolithic from Dereivka ca. 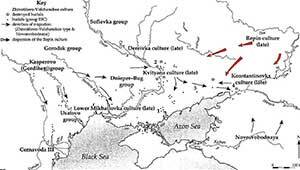 2890-2696 BC is of R1b1a1a2a2-Z2103 subclade, so Western Yamna during the migrations also of R1b-L23 subclades, in contrast with the previous R1a lineages in Ukraine. In Olalde et al. 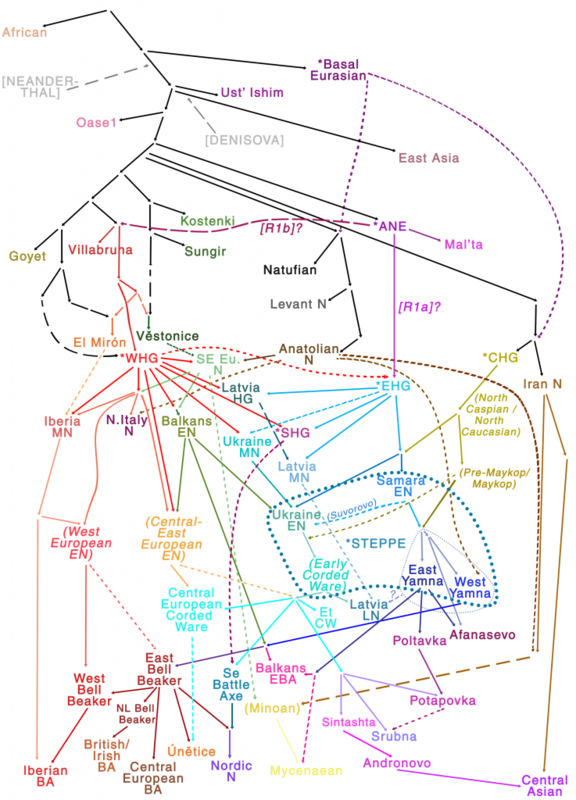 (2018), it is clearly stated that of the four BB individuals with higher steppe ancestry, the two with higher coverage could be classified as of R1b-S116/P312 subclades. 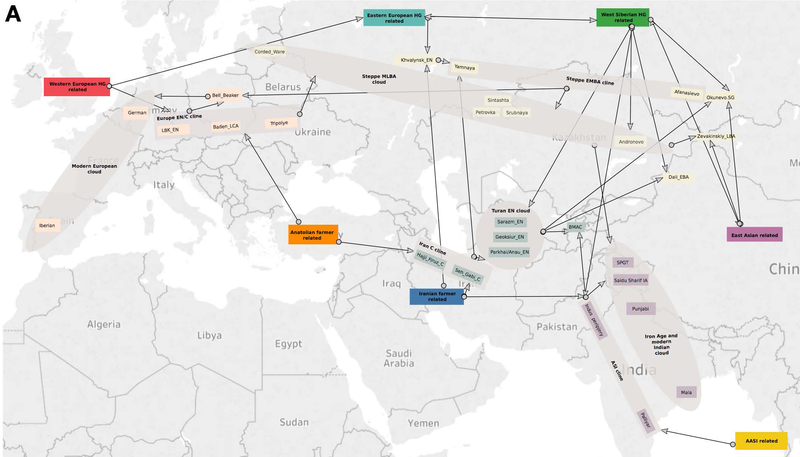 This is compatible with the expansion of Indo-European-speaking Yamna migrants (also mainly of R1b-L23 subclades) into the East Bell Beaker group, as described with detail in Archaeology (and with the population movement we are seeing having been predicted) first by Volker Heyd in 2007. 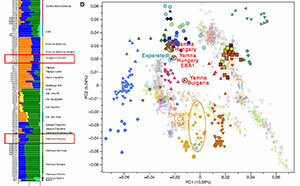 Also, the resurge of R1a-Z645 subclades in Czech and Polish lands (from previous Corded Ware migrants) accompanying other lineages indigenous to the region – seems to have happened only after the Bell Beaker expansion into these territories, during the Bronze Age, probably leading to the formation of the Balto-Slavic community, as I predicted based on previous papers. 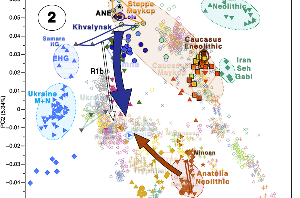 The fact that a sample of R1b-U106 subclade pops up in this territory is interesting from the point of view of a shared substrate with Germanic, as is the earlier BB sample of R1b-Z2103 for its connection with Graeco-Aryan dialects. 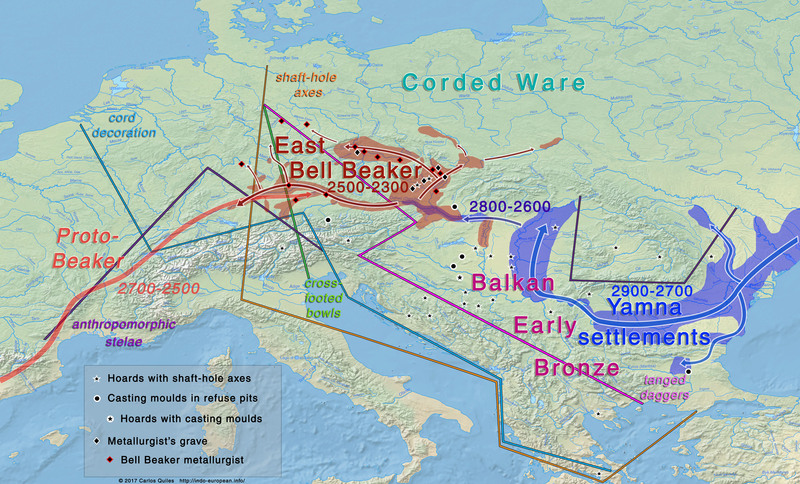 All this suggests that a North-West Indo-European dialect – ancestor of Italo-Celtic, Germanic, and Balto-Slavic -, supported in Linguistics by most modern Indo-European schools of thought, expanded roughly along the Danube, and later to northern, eastern, and western Europe with the Bell Beaker expansion, as supported in Anthropology by Mallory (in Celtic from the West 2, 2013), and by Prescott for the development of a Nordic or Pre-Germanic language in Scandinavia since 1995. 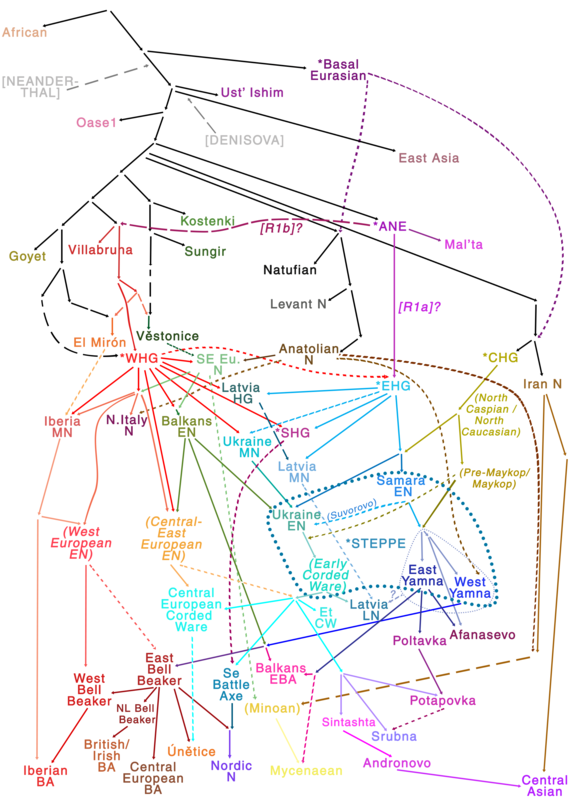 Maybe more importantly, the fact that only Indo-Iranian-speaking Sintashta-Petrovka (and later Andronovo) cultures were clearly associated with R1a-Z645 subclades, and rather late – after mixing with early Chalcolithic North Caspian steppe groups (mainly East Yamna and Poltavka herders of R1b-L23 subclades) – gives support to the theory that Corded Ware (and probably the earlier Sredni Stog) groups did not speak or spread Indo-European languages with their migration, but most likely Uralic – as seen in recent papers on the much later arrival of haplogroup N1c – (compatible with the Corded Ware substrate hypothesis), adopting Indo-Iranian by way of cultural diffusion or founder effect events. 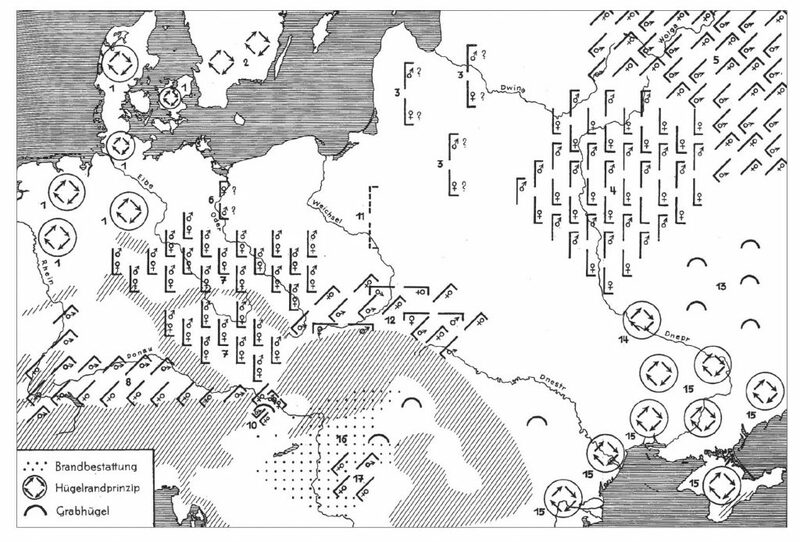 Finally, in Kurgan IV she saw “continuous waves of expansion or raids[that] touched all of northern Europe, the Aegean area, and the east Mediterranean areas possibly as far south as Egypt”. This was the period of the Catacomb Graves, but also the Early Bronze Age rock-cut tombs of the Mediterranean, Vučedol, Bell Beakers in Hungary, the Single Grave culture of the Nordic region. The Kurgan Culture reached Ireland, she remarked in a paper of 1978 “as early as 3500 B.C.” – by which she presumably referred to megalithic mounds covering passage tombs. According to Gimbutas, the “Kurgan people” are evidenced by single graves in deep shafts, often in wooden chests (coffins) or stone cists marked by low earth or stone barrows; the dead lay on their backs with legs contracted; they were buried with flint points or arrowheads, figurines depicting horses’ heads, boars tusk ornaments and animal tooth pendants. Human sacrifice was allegedly performed during the funeral ceremonies,and sometimes ritual graves of cattle and other animals were added. 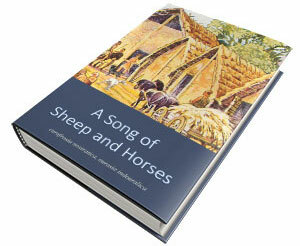 This is said to contrast with what Gimbutas called the culture of Old Europe (i.e. the earlier Neolithic of the Balkans), who “betray a concern for the deification of the dead and the construction of monumental works of architecture visible in mortuary houses,grave markings, tumuli, stone rings or stone stelae, and in the large quantity of weapons found in the graves”. 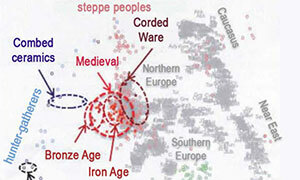 Research has corrected Gimbutas’ opinion on the time of spread of Indo-Europeans, on the role of the horse (see e.g. Anthony 2007) in their expansion, and the unrelatedness of the two main central European Chalcolithic archaeological packages: the Corded Ware package that expanded from the Balkans into north-eastern Europe, and the Yamna package (together with the proto-Beaker package) that evolved into the East Bell Beaker culture. 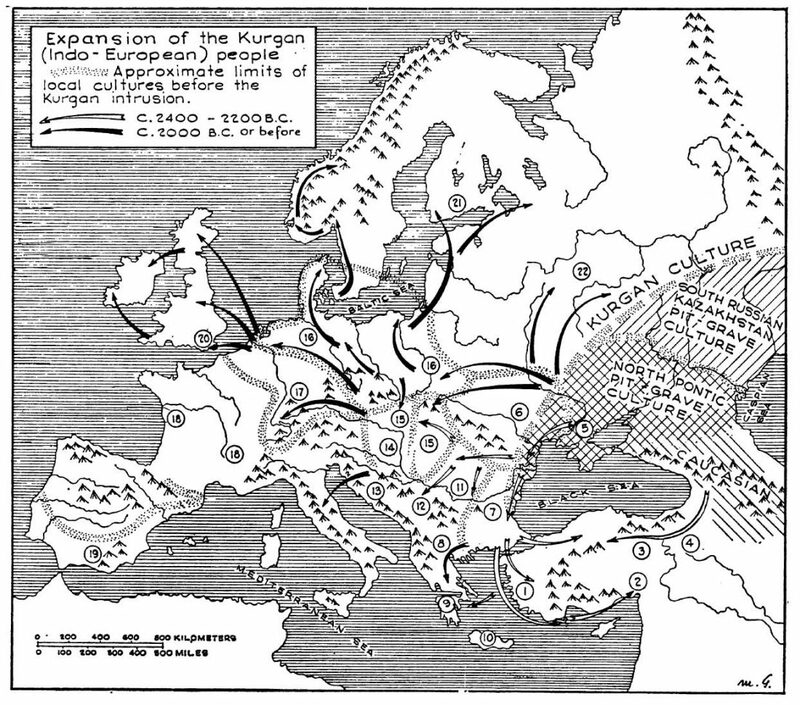 However, the shadow of the “Kurgan people” remains in the outdated body of innumerable writings. 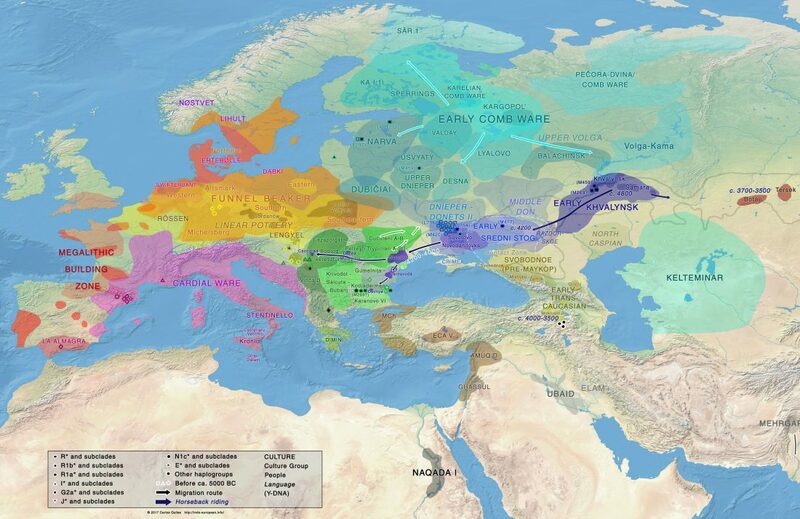 It was revived with the first attempts at disentangling Europe’s genetic past (based on the role of R1a in expanding Proto-Indo-European). Particularly strong in that sense is the model set forth by Kristiansen, who was nevertheless aware since his first proposal of the differences between the ‘Kurgan people’ of the steppe and those of the Corded Ware culture, selecting thus an alternative framework of long-lasting human and economic interactions between the “Kurgan people”, the Globular Amphora and Baden cultures with an origin of the culture in the natural region formed between the Upper Dnieper and Vistula rivers. The linguistic proposal is obviously compatible with mainstream archaeological models – which suggest the introduction of Pre-Germanic in Scandinavia with Bell Beaker peoples -, but since the linguistic proposal alone would probably not make such a fuss without the accompanying genetics, I guess this is the right way to publicise it. I doubt linguists really care about genetics, and I really doubt amateur geneticists will read the linguistic proposal, but who cares. Kristiansen’s traditional model is obviously in contrast with contemporaneous anthropological writings by Anthony, Heyd, or (Gimbutas’ pupil) Mallory, but is nevertheless becoming a resilient tradition in the interpretation of results in studies of human ancestry in Europe. 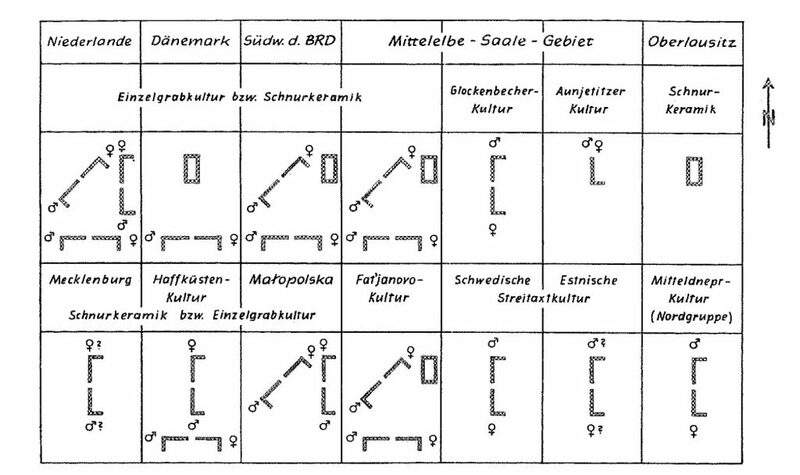 Featured image: “European dialect” expansion of Proto-Indo-European according to The Indo-Europeans: Archeological Problems, Gimbutas (1963). 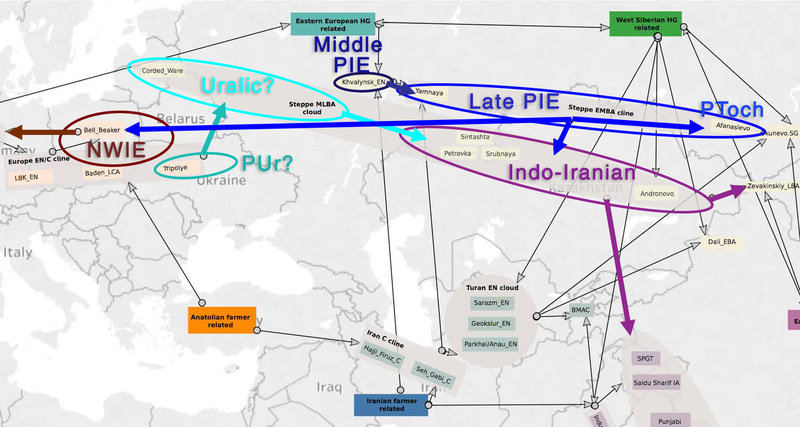 Observe the similarities of the western European expansion to the recently proposed expansion of R1b lineages with western Yamna and Bell Beaker.